Beginning in the 1990's Zefal started making floor pumps with a single piece molded plastic base which also functions as the compression tube's lower cap. 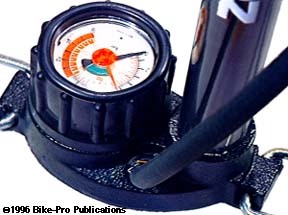 Any flex or irregularities in the compression tube's fit into the base during the down stroke, because the plunger isn't moved just straight up and down may cause weakness, air loss, or failure near where the compression tube joined the base. 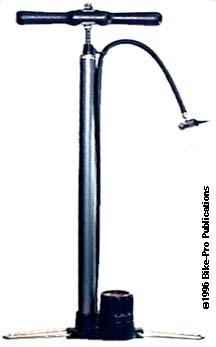 The first effort to manufacture a plastic base design was the original "Double Shot" which used two Blue plastic compression tubes side by side to compress air on both the up and the down stroke. The Blue plastic tubed original model was replaced with the current Black and Red plastic design, which we have experienced a higher than average return rate on. 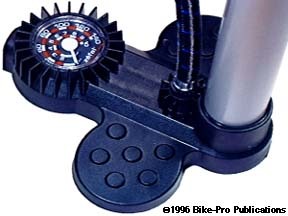 We no longer sell the Black and Red plastic Double Shot floor pump. The current Zefal brochure shows that they sell four floor pumps with a gauge, including the Double Shot, three are made in France, one in Germany. The three from France have a plastic base, the one from Germany has a cast steel one. We have included the three other than the Double Shot in our writing because their place in floor pump history hasn't yet been established, and they provide a possible quality alternative to a very poorly built Taiwan floor pump that you might buy locally for real money. At the price we sell each of these Zefal floor models for, they represent a good value. 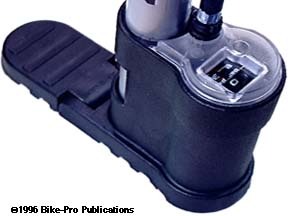 Lastly, Zefal's frame pumps have a justly deserved excellent reputation, none of their mini or full size frame pumps are known to have a significant failure rate.